I’ll be posting a more thorough update on our Global Poverty initiative and organization in the next couple days. I was supposed to be in Haiti this week to visit some orphanages and to learn more abou the global food crisis but had to make some changes due to the increment weather in that area. Today, I’d like to share about two things that make our goal of creating a grassroots movement to fight extreme global poverty possible: Human Relationships and Technology. By sharing a simple vision of compassion and justice, we hope to compel and invite people to join our cause so that 100% of donations to our “Giving Fund” can go towards small NGOs and CBOs [community based organizations] around the world that are already doing some amazing work in the fight against global poverty. We also envision using some of the funds to help start new initiatives and projects that in turn, can fund and impact more projects to build sustainable enterprises to empower people to lift themselves out of poverty. You may be shocked what can be done with so little in certain places around the world. When people scoff at what one person can do, consider this staggering statistic: 3 billion people in the world live on less than $2/day. The truth is you and I can make a difference and we cannot and must not allow “generosity” to be reserved only for the rock stars, Hollywood A-list, or millionaires. We’re banking our vision on the most significant and powerful resource: You. Me. People. And our relationships. Both as an “experiment” and in hopes of spreading the word of our vision to start this grassroots movement, we started a Facebook group several months ago asking people to join to help us fight global poverty. After only 111 days [Sept. 2], we reached our initial goal of gathering 100,000 people and it continues to grow [104,514 as of Sept. 9]. By the end of the year, we are estimating that abougt 250,000 will join the group. When we’re close to launching our group, we’ll release the beta website, ask folks to consider giving, have people suggest people and orgs that are doing great work, ask them to invite their networks and relationships – all while distributing these funds to sustainable people, projects, and organizations around the world and sharing these stories through every imaginable medium possible. 1. Join our Facebook group if you haven’t done so. Invite your friends [think strategically and globally] who might be interested in issues of poverty and justice. Another simple way to help is to POST the group on your “Posted Items” on your Facebook profile. 2. Consider making a small donation towards our organization – any donation. You may have noticed the new DONATE widget on the right hand column of this blog. Click on the red box or this secure donation link to give [Paypal, Debit, Credit Card]. If you’d prefer mailing in your donation, contact me. As many of the blog readers already know, my wife and I have personally covenanted $100,000 towards funding this organization which you can learn more about HERE. We are not asking anyone to do what we’re not willing to do. Here’s the screenshot to celebrate 100,000 people! Next do you prefer a christian president or not? Congratulations on reaching that 100K mark. I sent you an email with some questions about giving. 100k that is AMAZING! great job eugene. I am the Director of Watoto Wa Baraka, a non-profit dealing with HIV/AIDS orphans and poor communities in Kenya – East Africa. We have discovered that you have the same goals as we have, and we focus on food, water, sanitation, healthcare, shelter, education, information and access to other services. 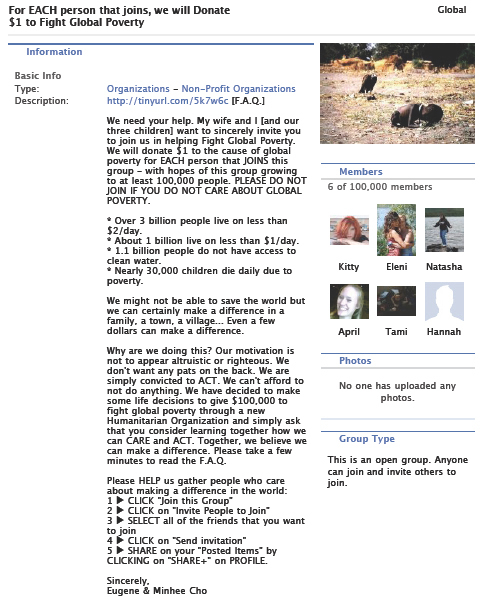 We are very interested working with you as your African partner to expand the fight against global poverty. Would you be interested in establishing a partnership with Watoto Wa Baraka? @geoffrey: thanks for your note. i’ll respond to your email via the message you sent me via facebook. continue the good work.